Who can access the Archives? The Ryerson University Archives collection is open to all of Ryerson’s constituents including students, staff, faculty and alumni. It is also available to external researchers and scholars as well as to members of the general public. Why would I need to do research here? Students may consult the collection for course-related projects, assignments and papers. Journalism students, for example, regularly research news stories, features and articles relating to the University. Architecture students will seek information on the University’s buildings and properties. 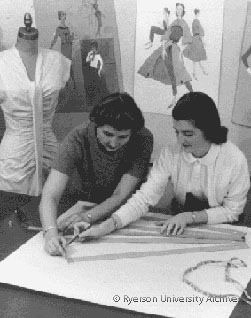 Students from the School of Fashion may research Ryerson fashions from the 1950s and the 1960s in preparation for their annual extravaganzas in the spring. As an educational resource, the Archives offers considerable opportunities for more advanced scholarly research. Many individuals have studied the significant educational and cultural developments of Ryerson’s historic past at St. James Square while others have examined more contemporary aspects of Ryerson’s unique academic and physical evolution from an institute of technology to a university. How can you help me with my research? The Archives and Special Collections (A&SC) staff are here to facilitate research and access to collections for the broader Ryerson community. Researchers are strongly encouraged to phone (416-979-5000 ext 7027) or email (archives@ryerson.ca) in advance of their first visit to the archives in order to schedule an appointment. When making an appointment, please include the reference number of the item, or collection or call number of the books you would like to consult. 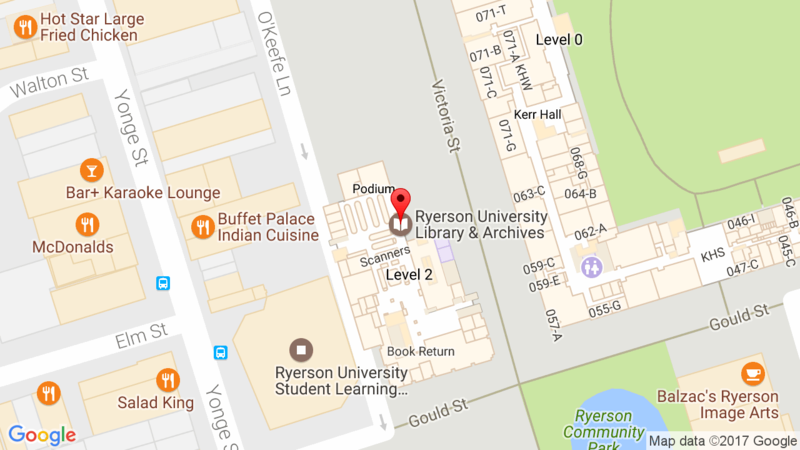 Books and periodicals can be searched in advance of your visit through the Ryerson Library catalogue. Any of the books or periodicals from the catalogue that are located in the Archives or Special Collections reading rooms will be noted as such in the ‘Location’ area in the record. All other A&SC materials can be searched in advance of your visit through the A&SC database. Please feel free to make an appointment for more in-depth research assistance tailored to your specific research interests by emailing Special Collections (specialcollections@ryerson.ca) or the Archives (archives@ryerson.ca) with the subject of your research, the collection you would like to access and your preferred time. The A&SC staff will enable you to engage in efficient and productive research by orienting you to the available materials and search tools that are relevant to your research interests. Unfortunately, we can’t conduct your research for you. We’re happy to help you locate and access records; navigate our database, catalogue, and paper-based finding aids; digitize material for educational use; access existing digitized material; and refer you to other collections items that are related to your topic. We can’t do things like conduct preliminary searches; research, locate, and digitize the results of subject-based search requests sent in remotely; read through large files in search of items relevant to your research; or clear image reproduction rights with third-party permissions holders. Can I use images from the collection? Please note that unauthorized reproduction of images contained on the Ryerson University Archives Web site, is prohibited. If permission is granted (please email the Archives archives@ryerson.ca for more information), credit shall be given to the Ryerson University Archives in any case where material is reproduced.